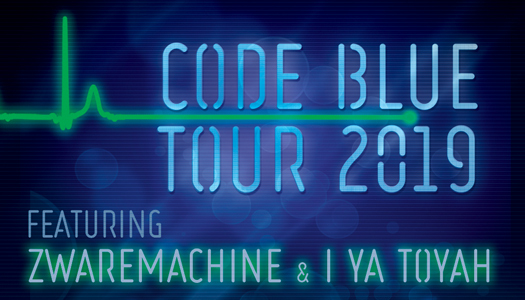 Two of the Midwest’s rising stars in electro/industrial have announced that they will be embarking on a co-headlining Code Blue Tour this Spring – Chicago’s I Ya Toyah and Minneapolis’ Zwaremachine! Beginning on March 1 in Madison, WI, the tour will see the two artists performing across the region until May 18 in Kansas City, MO; a full listing of tour dates can be found on the artists’ websites and on Facebook. As a special preview of the tour, Zwaremachine’s Mach Fox and I Ya Toyah have collaborated on a new single, which also features Zwaremachine bassist D-bot and will be performed live exclusively on the Code Blue Tour. With lyrical themes of “deception and promise,” “Smile that Killed a Country” will be available via Bandcamp on February 18 in a single and extended mix. I Ya Toyah’s highly acclaimed Code Blue debut album was released on October 26, 2018, while Zwaremachine’s most recent release was the “Remain Unseen” single, released as a “name your price” item on December 10, 2018; prior to that Zwaremachine’s full-length Be a Light album was released on April 11, 2018.